The Consell Insular de Formentera in order to improve and modernize the collection and cleaning of the town of Formentera, in late March 2007, implemented a new management system for home collection of the different fractions: litter, glass, paper and packaging. In parallel, has set up the phone 900 102 656 Citizen Service where you can request free home collection of household appliances, furniture and old, the collection of commercial paper and cardboard and any other information relating to waste. To clean the containers and urban areas of the island has become a vehicle rentacontenedores, a flusher of 6000 and 5000 liters sweeper. Have strengthened the cleaning services during the summer, increasing the personal and material resources to meet population increases that occur with the tourist season. It has contracted the maintenance of the municipal gardens and clearing work has included the sidewalks of public roads. 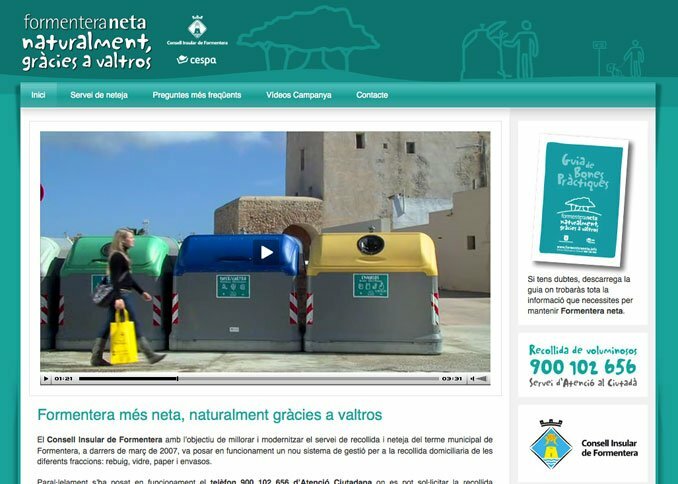 The company responsible for managing the collection and transportation services, solid waste and organic matter, street cleaning and maintenance of green areas in the town of Formentera is grass. The system chosen for the collection and emptying of the containers was the EASY system that incorporates a robotic system to perform these operations. If you want more information, please access to the cleaning service website where you will find complete information on the cleaning service, download files, videos, news, FAQs, etc.